The purpose of this assessment probe is to elicit students’ ideas about weathering, erosion, deposition, and landforms. It is designed to determine if students recognize that sand on a beach may have come from distant mountains and landforms as a result of the weathering of rock, subsequent erosion, and deposition. This formative assessment probe by Page Keely does an excellent job of finding out what students think about the source of sand. Following the probe is a section that describes the correct answer and helps teachers of all grades to understand what children are thinking and what their misconceptions might be. II used this activity as a pre-test for my weathering and erosion unit. I had the students pick their side and write why they chose it. I took a class poll on which friend they agreed with. I now have a clear picture on where I need to start teaching during my unit. Students have to stop and think about the process of weathering in order to answer this probe correctly. I believe that because it seems so easy of an answer, several students (at least middle school) will write the first thing they think and then move on. What I like is that these probes teach students to stop and think about even seemingly simple questions. Although I completely hold Page Keeley’s Formative Assessment Probes in the highest regard, this is one that does not lend itself at all to my students, and so I find it limited. I’d like them to be able to think about this, but since they live in the Bronx, it’s hard for them to imagine walking along the beach like the kids in the probe, and they don’t have the personal relationships with rocks that I did growing up in a woodsy suburb. Therefore, this probe would be very useful AFTER the investigations and lessons about weathering and erosion, at which point, if I had brought in sand and sandstone, and done a good job of connecting them, my kids would enjoy this probe as much as the others I’ve used. "Beach Sand" is an assessment probe to determine student's ideas about weathering, erosion, deposition, and landforms. The probe leads the student into thinking that "mountains & landforms", "rocks on the ocean floor", and "undersea mountains & sea floor formations" are the only way sand forms. 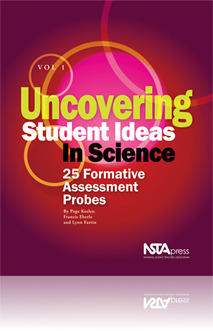 This probe can add to misconceptions that students may already have or introduce misconceptions that they have not developed yet if it is not introduced to the class correctly, which is NOT the purpose of the probe. Too much is left out of this probe to correctly assess what the students know about weathering, erosion, deposition, and landforms to use this effectively.